Most families know that dinnertime is an important part of family life. In fact, research shows that sharing meals increases overall health, decreases risky behaviors in children, and creates healthy habits. Still, finding the time and ability to eat together regularly is difficult in today’s world. And even if you do plan to eat together, it isn’t unusual to battle distractions, complaints, fatigue, or even a lack of conversation. 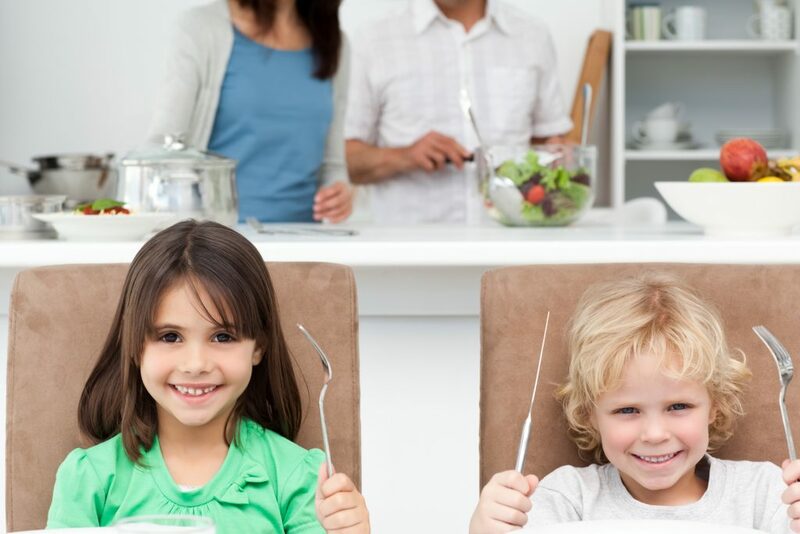 Here are some ways to make the most of family dinnertime so your family can reap the benefits of regularly gathering together. Especially in a world bombarded by noise and screens, it can be challenging to truly be present. However, family dinnertime means more than just sitting around the same food. If your family is going to reap the benefits of a family meal, that means you need to turn off the television, put away your phone, and commit to being engaged for the duration of the meal. This doesn’t mean that you can’t enjoy the occasional movie night or rushed dinner while checking your email. But research shows that for your family to benefit from family mealtimes, you need to prioritize a real, undistracted meal at least three times a week. An great place to start as you eat together is to share about your day. Young children aren’t always able to easily recall the events of their day, so begin by sharing your own details. Then ask your children specific questions, such as “What was something that made you laugh today?” or “Who did you play with at school?” The questions will frequently refresh a child’s memory and encourage them to share more about the events of the day. There are plenty of games that will work during family dinnertime with little or no preparation. Guessing games like I Spy or 20 Questions are simple and even young children can easily participate. If you want to add more structure to your dinner games, try taking turns on a board game between bites. Candy Land, Chutes and Ladders, Sneaky Snacky Squirrel, and other beloved children’s games don’t take long to play and would work nicely. For slightly older children, word games like Mad Libs or MadGab are fun since they often inspire laughter and keep everyone working together. Even just telling a story together, with every family member contributing details, will pass the time quickly and keep everyone involved. One of the best parts of being a family is dreaming together. Encourage your family to make plans together as you enjoy family dinnertime. If you have an upcoming trip, birthday, or holiday, discuss the details and everyone’s ideas. If there isn’t anything on the horizon, plan a new adventure for the weekend or a project around the house. Even if you just spend time planning meals for the week or tomorrow’s packed lunch, the collaborative effort will do your family good. Family dinnertime is a great time to try new foods or beverages. If you are feeling particularly adventurous, visit the ethnic food aisle at the grocery store and choose something unfamiliar. On the other hand, if you tend to have more conservative tastes, look for an interesting fruit or vegetable in the produce section. Give everyone at the table a chance to try the new item and then discuss your thoughts on it. Create a rating system for new foods, including categories for taste, appearance, and likeliness to try it again. This tradition not only gives you something fun to do together, but it encourages your children to try new foods when given the opportunity. Family dinnertime becomes a respite after long hours at work or school. Taking the time to laugh, talk, and play together creates an atmosphere of connection and growth. If you are looking for a childcare provider that encourages and supports families, consider Legacy Academy Flynn Crossing. Call or visit today for more information.